Another cool Spring morning enticed me out early this Saturday, the sun just above the horizon and peeping into the garden, enveloping all in its warming glow and highlighting zesty colour combinations. All the plants but one in this Saturday's Six are new to the garden this year and it has been both satisfying and exhilarating to watch them as they acclimatise themselves and begin to fill out. One: Verbena bonariensis. 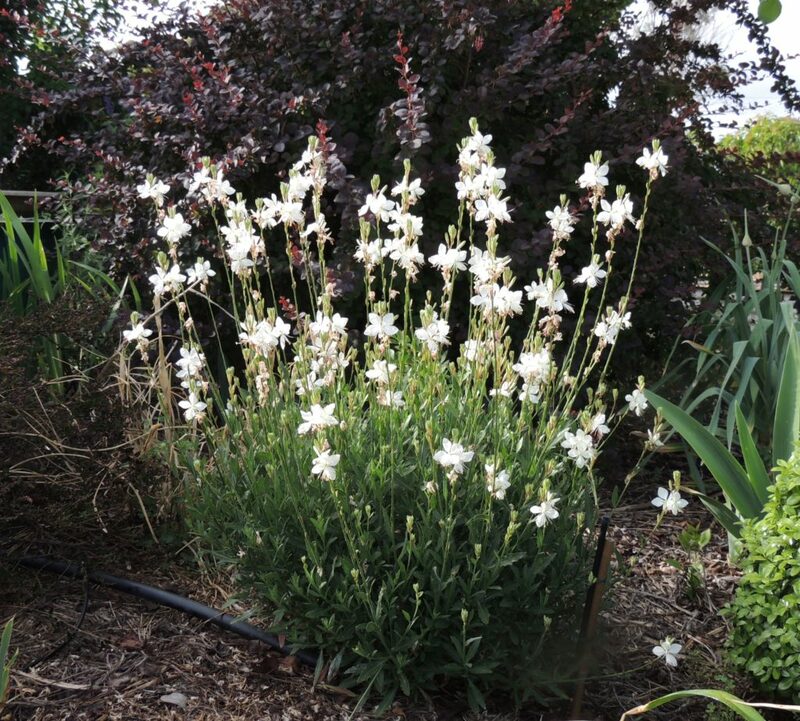 This airy perennial has leapt out of the ground and is happily taking its place in the back row of the garden. I first saw it recommended in Piet Oudolf's book 'Dream Plants for the Natural garden'. Its scaffolding of stalks means that it doesn't form a solid wall and I like the way other plants can be seen through it: that's Prostanthera poorinda 'Ballerina' behind it. Two: Do they clash, or do they not? Geum 'Mrs J. Bradshaw' and Salvia nemerosa. I rather like this colour combination, a shrinking violet it is not. Three: This dwarf Gaura makes a strong statement against the background of dark foliage of the Berberis behind it which throws the white flowers into sharp focus. 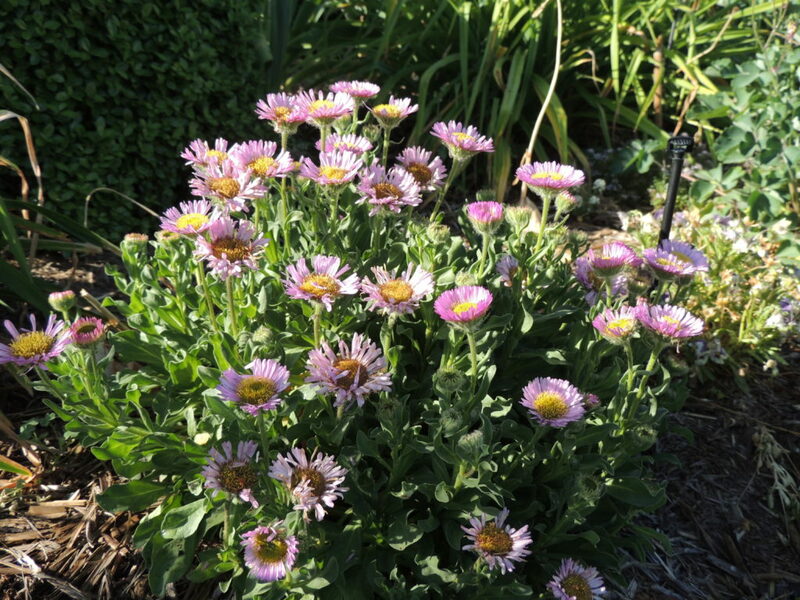 Four: Erigeron glaucus 'Seabreeze', also new to the garden, came through last winter's frosts unscathed and is now producing many daisy-like flowers in an enchanting mauve-pink. I'm hoping it will reproduce itself via contact with the ground in the way its cousin karvinskianus does, as it seems to be an excellent space filler. Five: Aqueligia 'Crimson Star'. I fear my garden is too hot for this charming plant, and that I'll have to try to find a more shady home for it before too long. This morning it was looking very happy though, lit by the rising sun. Six: Not new to the garden, but surely unsung heroes, Allium sphaerocephalon 'Drumsticks' are preparing to flower. What steadfast soldiers they are, standing to attention, their backs ramrod straight, marching to their own tune. They are appearing all over the garden and bring such delight with their no-nonsense approach and undemanding ways. From green flowers to purple, followed by 'bad-hair-day' seed heads, they bring interest to the garden for a very long time. That's my six for this week. If you would like to join in Six on Saturday, or merely look at what others are doing in their gardens, do pop over to The Propagator's blog and join in. Weather today, sunny and 10-27 degrees C. Happy gardening everyone. Next Post A Single Man? 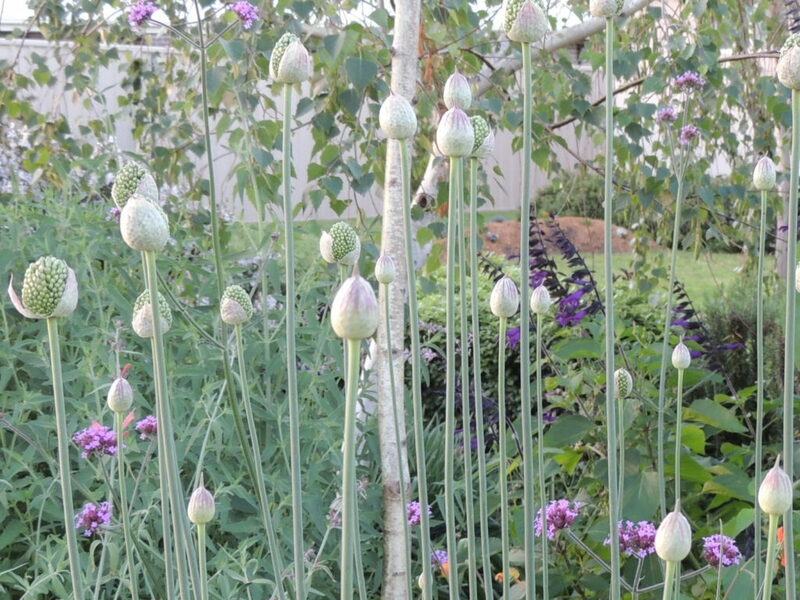 You’ve shown two of my favourites this week – aquilegia and allium. I’ve tried growing aquilegia before without much success. Perhaps I should try again. Where did you get the allium from? I don’t remember exactly where I got the Alliums, but most probably Lambley Nursery who are sure to have them through their online shop. They have a good selection of bulbs, but their catalogue won’t be available until after Christmas. They’ve lots of other enticing bulbs too! Golly, Jane. Am making lists! Love the allium. Particularly when they have bad hair! Also, the dwarf gaura. I didn’t know there was such a variety. Shall seek it out. A chap along the road has a bank of gaura which he almost cuts to the ground in our southern August and now, its a picture of white feathery flowers. And i am rather keen on the verbena – for exactly its airiness. Thank you for today! The Allium gives a lot of pleasure, Prue! A bank of Gaura would look stunning. I cut all my perennials down to the ground at the end of July and they come back again during Spring. Such reliable plants. I am wondering if that Verbena is going to be a bit of a thug- it has grown like the proverbial weed! Your flowers are so beautiful and a delight for the already winter weary eye. Ha ha…I felt the same looking at your flowers during our winter! I love that pinky/purple red combo, Jane. There should be more of it in gardens. And the Aqueligia is very dainty. You have so many flowers. It looks like hard work. It isn’t so much work, Tracy as I plant mostly perennials which don’t require a lot of attention, and the annuals I choose are pretty hardy, such as portulaca. Once plants seed themselves around the place, they seem much happier. We’ve quite a big garden (for the ‘burbs) and I’m realising just how long it takes to fill a garden up. Once it’s full, I probably won’t have anything new to write about!! Nice Six! The geum/salvia combo is great. The alliums will be spectacular and you have just reminded me I have some to plant. I just love the way they break open from their package and slowly reveal their beauty. Feeling warmer already! Thanks Gill- I’m thinking it isn’t possible to have too many Alliums, although I could be proven wrong in years to come. To me, they’re perfect: so hardy and completely undemanding. As I said to Prue, it’s very nice to see aquilegias at this time of the year when our gardens are so sleepy. I also do liked the combo of geum/salvia. I felt much the same during our winter, Fred. I’m hoping the Aquilegia will survive in my garden as I don’t have a lot of shade- I was perhaps a little ambitious planting it. Thank you, Derrick, I’m appreciating the Verbena and am sure it’s going to do well in our climate. I love the dwarf Gaura. I struggle with it here (probably too wet) but even if it grows well it is leggy. Yours looks perfect. I must look out for it. It comes in a couple of pink shades as well, Jessica, but I thought the white would look good against the Berberis. Also, I thought white in the garden would provide some lightness in the summer. My aquilegia have gradually self seeded to where they are happiest. That’s what I’m hoping will happen here too! Self seeded plants always seem to be much happier. I really enjoyed seeing your palette, which is so very different from our autumnal tones! 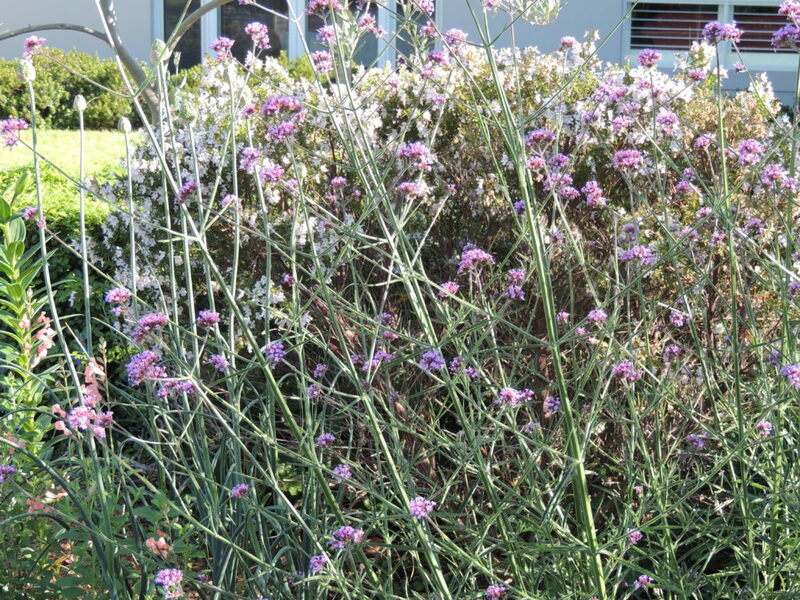 I love that header image of Verbena bonariensis. It is such a great plant, isn’t it? It is a great plant, though I wonder how big it’s going to grow! I’ll find out soon enough, I’m sure. One of the pleasures of SoS is seeing gardens from the other side of the world. Wow, all those newbies look very happy in your garden. Sometimes your SoS is so full of familiar faces, it’s hard to remember you’re in such a different climate. And then you mention difficulties w/one of them, like the aquilegia, which grows like a weed here, & I’m brought back to earth. Yours is quite beautiful, btw, so hope you can find it a happy little corner. I do try to choose hardy plants, but every now and then common sense flies out the window as it did when I bought that aquilegia (and a geranium, which is struggling). The main problem is lack of shade and I’m waiting and trying to be patient about trees growing. If you had 35, it’s probably on it’s way here! We’ve had a pretty mild spring so far and reasonable rain, so the garden has been at its best. 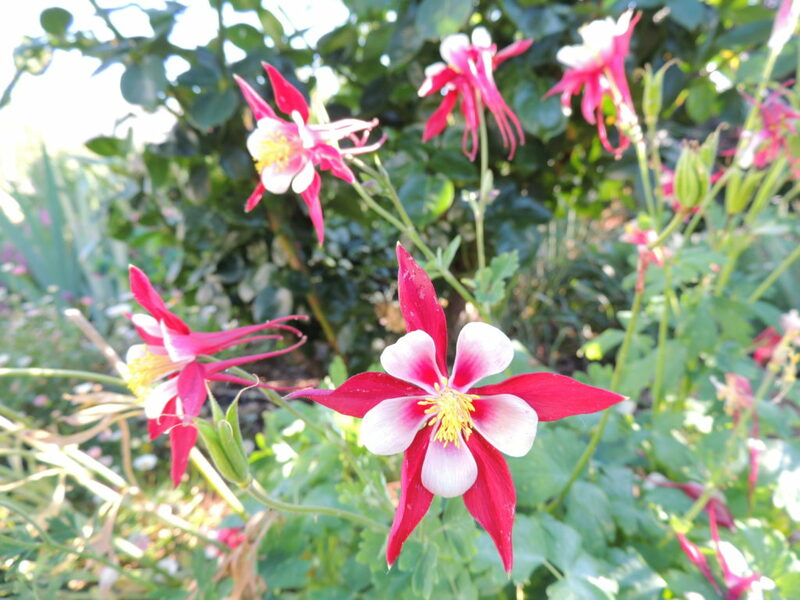 I bought several Columbines as ‘fillers’- probably not the best choice. Well it is definately time to mulch well and get ready for fire season then because if this is any indication of summer it is going to be a dangerous one unfortunately. I did take a cutting from the Erigeron but it failed. I’ll try again and I’d better get on with it as soon the weather will be too hot. I’ll be looking at your Alliums when my garden is dreary, Jude! Oh I am jealous of all your beautiful summer flowers as we sink further into dank darkness. I love the aquilegia and I shall certainly look out for the nice compact gaura. A lovely six. Thank you Chloris. I wish I could remember the exact name of the Gaura to tell you; I seem to have lost the label. Your garden makes me yearn for spring (even if I still have plenty of work to do during our fall season). For some reason, I’ve had problems getting that Verbena to survive more than one season here but seeing them in your garden makes me think I should try them once again. My fingers are crossed that the Drumstick Alliums I planted last year return again in the coming spring – dare I hope they’ll also multiply? It’s strange that the Verbena doesn’t do well for you Kris, as it seems such a tough plant: its leaves and stalks have the feel of a plant eminently suitable for a challenging climate. My Alliums have multiplied like mad: they are pretty tough too and I’m sure you’ll find you have lots more than you started with. Great six. Those alliums are very effective en masse. There’s no such thing as clashing colours in the garden! The aquilegia is lovely. Thanks, and I think you’re right about the clashing colours! Great photos! A verbena appeared unplanted in my garden this summer. I hope it will return in the spring. I feel sure it will Cathy. I think that particular Verbena multiplies rather well. Oh, I’m a bit envious about the rain, Pauline! The Bureau is telling us we might receive some more, so I hope they’re correct as there’s very little water in the dams. I’m sure Alliums will grow well for you in a well drained spot. Echinops are great-I have a couple and am waiting for them to flower. Just lovely, in all respects. I keep going back to Dream Plants for the Natural Garden. A really useful book. I agree, Tim. It’s probably my favourite plant book-such sensible suggestions. Hello Jane. Funny you mention the drumsticks. I almost stood in a patch of new growth of the same plant yesterday. Just very slender new stems but a sign of summer to come. I do like your gaura, i have a pink one. Pretty. I have a pink one, quite a dark pink, also. Good value. Grows easily from cuttings! 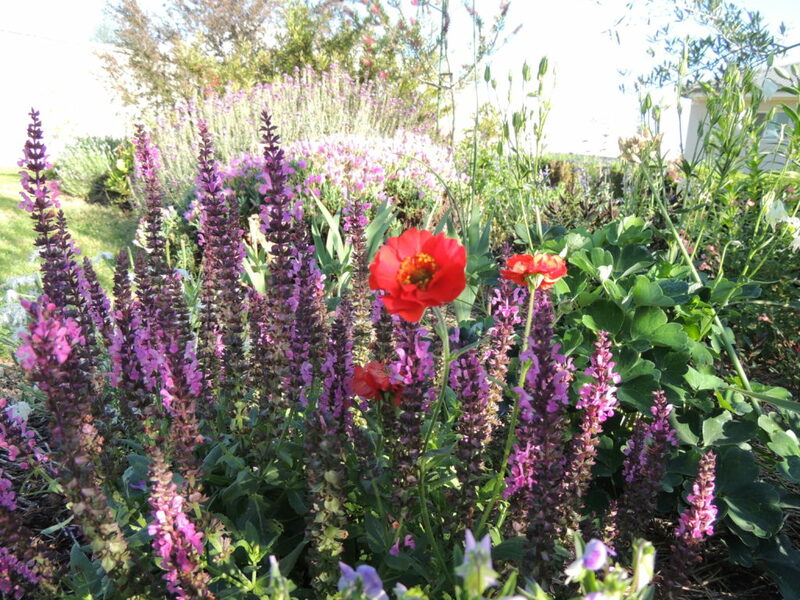 A beautiful selection of flowers – I think your geum and salvia look dandy together. Stunning aquilegia and I am intrigued by your Erigeron which I have not seen before. Thank you. The Erigeron seems to a tough little plant and well worth seeking out. Of them all, it’s the Aqueligia that I love the most. They’re very sweet, aren’t they. SO many lovely flowers! I don’t think the Geum and the Salvia clash at all. A very vibrant and beautiful combination. Your post is a lovely reminder of spring as we are going into the dark dephts of late autumn here. Thank you Maria. You might be in the dark depths of Autumn, but all looks green at yours. It won’t be green here much longer as the hot weather dries everything out.